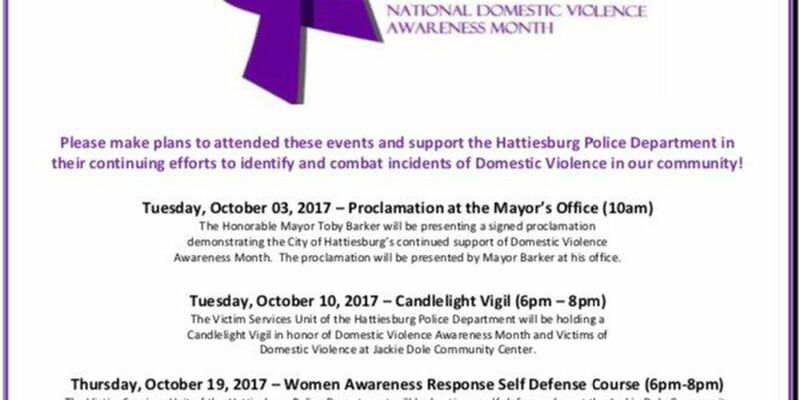 HATTIESBURG, MS (WDAM) - The month of October is National Domestic Violence Awareness Month, and the City of Hattiesburg has several events planned that will continue to identify and combat incidents of domestic violence in the community. Events include a candlelight vigil, a victims walk in downtown Hattiesburg and a self-defense class. On Tuesday, Oct. 3, Mayor Toby Barker will present a signed proclamation demonstrating the city's continued support of Domestic Violence Awareness Month. A candlelight vigil will be held for victims of domestic violence the following Tuesday, Oct. 10, at 6 p.m. at the Jackie Dole Community Center. The Victim's Service Unit of the Hattiesburg Police Dept. will also host a self-defense class at the Jackie Dole Community Center on Thursday, Oct. 19. Latosha Myers-Mitchell of HPD had a few tips to share if any citizens find themselves in a potentially dangerous situation with a spouse or loved one. "When someone is involved in a domestic situation, they should stop, slow down, try to remove themselves from that situation," Myers-Mitchell said. "Take a timeout, and know that there is help out there for you. If you cannot personally remove yourself from the situation, you should call 9-1-1 or call someone for help." On Sunday around 8 p.m. a domestic altercation occurred between a man and his wife on North Chancellor Road in Palmer's Crossing that resulted in a shooting. Roy McNair Sr. of Hattiesburg was charged with domestic violence-aggravated assault in connection with the shooting. The female victim is listed as being in critical condition at a local hospital.